Children are brave. Sure, they believe in monsters under the bed or lurking in their closets, and – partly because of those monsters – they might be afraid of the dark. But where it counts, in the real world, where they risk real pain or injury or failure, they are incredibly brave. They plunge into school year after year and deal with transitions galore, from harder material to a particularly strict new teacher to a goon who might be sitting next to them in class or hassling them in the school yard. They climb trees with abandon and look down from those lofty heights, and while it might inspire a bit of caution, it doesn’t keep them from doing it. They learn to ride a two-wheeler or to ice skate and, again, just do it. They don’t like falling, and they don’t want to fall, but they don’t let the thought of failure or pain keep them from their goal. Recently, my daughter was in a swim lesson at the Y, and I was doing an indoor cycling workout and watching her down below through the big bay windows that overlook the pool. In my daughter’s lessons, they use the adult lap pool. Back and forth she went, over and over again, her teacher walking alongside, periodically instructing her. Freestyle back and forth, back and forth. Back stroke. Breast stroke. Butterfly. OK, let’s work on your diving. Now your kicking. On your back, arms outstretched, no stroking, just kicking. Back and forth. Back and forth. Again. Again. Again. Meter after meter, length after length, lap after lap. And I’m sitting up there on the indoor cycle and taking inspiration from watching my daughter go. She swam without complaint. She worked quietly and determinedly. She was without fear. She had to have been suffering, particularly during the prolonged kicking drill, but she didn’t show it. She pushed through it, and I pushed myself on that bike, because I wanted to stand with her the only way I could at that point. I can’t swim the way she does. I mean, I’m safe and fairly functional in the water, but I’m uncomfortable and stiff when lap swimming. I lack rhythm in the water. I don’t let myself do it. I’m afraid of swallowing water, looking like an idiot, not making the grade. And that fear stands in my way. What I should do is get some lessons and re-learn to lap swim. It would be great for me. But fear is a barrier. In contrast, my daughter joined a swim team over the summer unable to swim more than one-third of a length before stopping. That’s about 8 meters. By the end of the summer, swimming day after day, working herself hard, listening to her coaches, and just flat out swimming with the kind of grit and fearlessness that I think many kids possess, she swam 100 in competition. Straight through. No stopping. No fear. Then came our annual family trip to a rustic, lakeside family camp. It is our one true get-away, and we love it dearly. At the camp, there are a couple of swimming tests, the longer and tougher of the two being to permit a child to go onto the beach alone. If they don’t pass, then they can’t even set foot on the sand without an adult, not even to look for sea glass or colorful stones. The beach test involves going from the little camp dock to the beach without touching the bottom, about 250 meters of open water, dealing with waves from boat wakes, currents, chilly pockets, sea monsters, what have you. My daughter did it, and she did it beautifully, with a strong crawl stroke, stopping only a couple of times to turn on her back for a quick rest and to chat with her mom, who was nearby. The thoughts that led to this post started as I watched her pass that test. 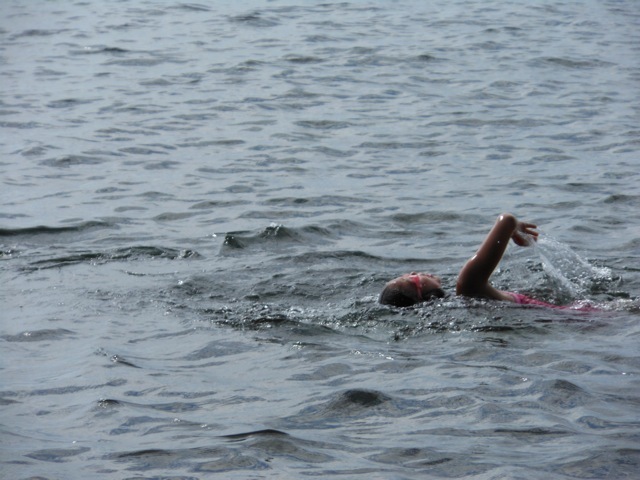 Afterward, she confessed that it was a long way to swim, but she hadn’t experienced any fear. Not a bit. After all that, I suppose her swimming length after length at the Y doesn’t feel like a big deal to her. I suspect that children’s lack of fear is linked to their relative lack of inhibition, which in turn seems linked to their inherent playfulness and innocence. As adults, we gradually seem to play less. And we take far too much far too seriously. We let all kinds of things get in our way, including our fears of pain and failure, and particularly our fear of shame. Our inhibitions build up. We hold ourselves back. I’ve heard it said more than once that great athletes have the capacity and willingness to suffer more than most people. They will work their bodies right up to that “oh no!” point and then push beyond it, making athletic gains where many would have stopped. They have a goal, and they are determined to achieve it. Maybe kids are a bit like that. They look at a task that they want to accomplish, and rather than dwelling on the barriers and potential bad outcomes and what others might think, they plunge in and just do the task. They get into the water, or on the horse, or on the bike, or on the ice, and rather than thinking about all the bad stuff that might happen next, they lose – and ultimately find – themselves in the sheer joy of seeking and achieving mastery through play. Sure, I’m proud when I see my daughter do something like that. But even more than that, I’m humbled.